Group C of the 2018 FIFA World Cup took place from 16 to 26 June 2018. The group consisted of France, Australia, Peru, and Denmark. The top two teams advanced to the round of 16. The two teams have played four time before the most recently was a friendly in 2013, and France won 6-0. ↑ "2018 FIFA World Cup – Statistical Kit" (PDF). FIFA.com. p. 7. 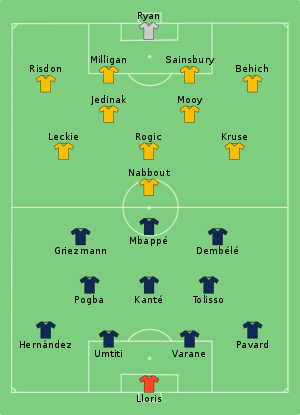 ↑ 4.0 4.1 4.2 "Tactical Line-up – Group C – France-Australia" (PDF). FIFA.com. Fédération Internationale de Football Association. 16 June 2018. Retrieved 16 June 2018. ↑ 6.0 6.1 6.2 "Tactical Line-up – Group C – Peru-Denmark" (PDF). FIFA.com. Fédération Internationale de Football Association. 16 June 2018. Retrieved 16 June 2018. ↑ 9.0 9.1 9.2 "Tactical Line-up – Group C – Denmark-Australia" (PDF). FIFA.com. Fédération Internationale de Football Association. 21 June 2018. Retrieved 21 June 2018. 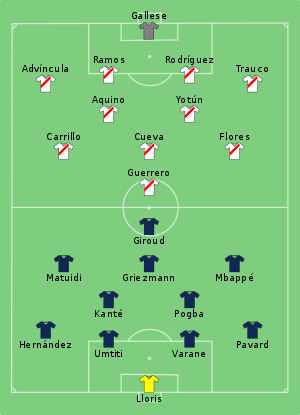 ↑ 12.0 12.1 12.2 "Tactical Line-up – Group C – France-Peru" (PDF). FIFA.com. Fédération Internationale de Football Association. 21 June 2018. Retrieved 21 June 2018. ↑ 15.0 15.1 15.2 "Tactical Line-up – Group C – Denmark v France" (PDF). FIFA.com. Fédération Internationale de Football Association. 26 June 2018. Retrieved 26 June 2018. ↑ 18.0 18.1 18.2 "Tactical Line-up – Group C – Australia v Peru" (PDF). FIFA.com. Fédération Internationale de Football Association. 26 June 2018. Retrieved 26 June 2018. This page was last changed on 15 January 2019, at 15:10.